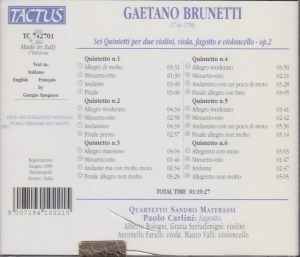 It took me a quarter of a century to come around to listening the three symphonies of Gaetano Brunetti recorded by Concerto Köln in 1994, but then I was so bowled over that I immediately had to explore more of this composer. Many of the “minor” composers of the past – those viewed today as minor, although they may have enjoyed great fame in their time, as great or greater than those now viewed as “the giants” (e.g. Haydn and Mozart in the classical era) – are still remembered and performed today, usually thanks to one or two concertos that have remained in the instrumentalists’ repertoire: Quantz, the Bach sons, the Stamitz father and son, Dittersdorf, Boccherini, Salieri, Clementi and others: they never entirely disappeared from the music world’s consciousness, even if it was through a mere pinkynail from their complete output. But Brunetti! Talk of a truly unknown… There was an attempt in the 1950s and 1960s to revive his symphonies, spearheaded by conductor Newell Jenkins, but it petered out and had no immediate following (for more on this see my review of Concerto Köln’s disc). Recordings of his symphonies and chamber music have been trickling out of Spain of late (or rather: trickling IN Spain, given their very limited distribution out of it – see my Brunetti composer entry for a list), but Brunetti largely remains unknown quantity. One explanation of this neglect may be that very few of his scores were published in his lifetime, most manuscripts were kept in jealous secrecy in the coffers of the royalty for whom they were written (the liner notes aren’t entirely clear about the status of those Bassoon Quintets. 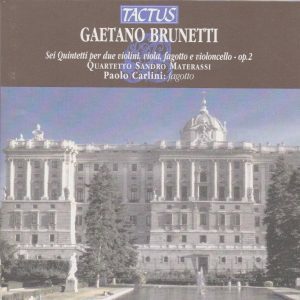 They claim that the performance is based on manuscript held at the library of the Palacio Real in Madrid, but that they bear an “opus 2” catalog number implies that they were among those works of Brunetti that indeed were published in his days). The other is of course that Spain is and remains a periphery of music making and record producing. It is easy to think of Brunetti in the same terms as Scarlatti or Boccherini: as an Italian established for a while, or durably, in Spain – the comparison with Boccherini is especially tempting, as they were born a year apart, Boccherini in 1743 and Brunetti in 1744 – but in fact it isn’t the case: Brunetti followed his Italian parents to Spain still in his teens (his father was also a musician), so a good part of his training and influences took place there. And, like Scarlatti but contrary to Boccherini, he never left. And that’s precisely what seemed to be in evidence in the three symphonies recorded by Concerto Köln: certainly Boccherini, as Scarlatti before him, let Spanish influences sip into their music, but (if I may quote myself) “in the case of Brunetti, there’s more, there’s the fact that some elements of style, form and character seem entirely genuine and can be retraced to no “mainstream” formal models in force in the music centers of Europe that I can establish. In that sense, the music sounds, indeed, entirely vernacular, grown in a place – or in a creative mind – not entirely pervaded by foreign influences and models”. And, on the basis of those three symphonies, it seemed to me like Brunetti could be “your major unknown composer of the classical era, one of unparalleled originality and no peer that I can think of”. So sure I needed to explore more, and test that hypothesis. Well, I’m not so enthusiastic with this one. Sure, the music is charming in its galant and elegant style, but it’s little more than that: just “classical style” surface charm and elegance, Finales are dynamic and full of verve, but there’s hardly any other emotion, no more inward or somber or tormented moods, and the Quintets hold little of the surprises found in the symphonies. There are a few darker and more dramatic streaks in the Andante of the Sixth Quintet, a few Mozartean turns of phrases that also catch the ear in the Andante of Quintet No. 3 and Menuetto of No. 4. The trio section in the Menuetto of the First Quintet (0:32) is notable for its ear-catching plaint by (if ears don’t deceive me) viola, and the trio in the Menuetto of the Fifth Quintet (1:02 to 1:58) for its almost pre-Schubertian hues. But in general those Menuettos tend to become very formulaic; the “Menuettos” of the symphonies were as well, but the formula was entirely original, with the outer sections scored for winds alone and usually in the character of boisterous Spanish dances, and the trios for strings alone. Nothing like it here, just – and this applies to the Quintets as a whole – charming but inconspicuous salon music. Not that this doesn’t make for a pleasant 70 minutes of listening. But there isn’t much substance beyond the galant pleasantry. Well, these are Brunetti’s opus 2. Give him time to develop some originality. I’ll continue my exploration of his music. Recording is fine and, in the absence of comparison, interpretation doesn’t call for any particular comment.